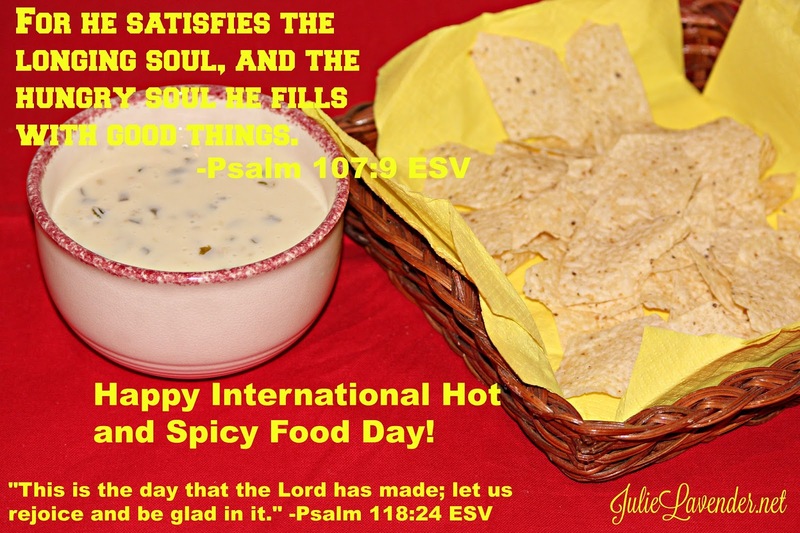 Celebrate International Hot and Spicy Food Day with this Spicy Cheese Dip. It'll add warmth and spice to a cold January day! In a food chopper, combine the chiles, jalepeno slices, jalepeno juice and just enough of the milk to allow the vegetables to blend. Press chopper intermittently until the chiles and pepper slices are diced into very small pieces. Combine all of the ingredients in a microwave-safe bowl. Microwave in one-minute intervals, stirring after each minute. After several stirrings and when the cheese is beginning to melt, use a whisk to stir after each minute-interval of cooking. Continue microwaving, one minute at a time, until the cheese is completely melted and all ingredients and blended. Serve with a selection of favorite chips and enjoy! Celebrate National Soup Month with this scrumptious Cheesy Potato Soup recipe. It'll warm your tummy on a cold January day! In a large saucepan over medium heat, bring to boil the broth, salt, pepper, vinegar, and potatoes. Turn down the heat, cover, and simmer for 20 minutes. Meanwhile, whisk together the flour and milk in a large measuring cup. Remove the potato mixture from the burner after the twenty minutes of simmering and slowly whisk in the flour and milk mixture. Place the saucepan back on the burner and cook for an additional eight to ten minutes, stirring often, until the soup thickens slightly. Stir in one cup of cheddar cheese until melted. Remove the pan from the burner. 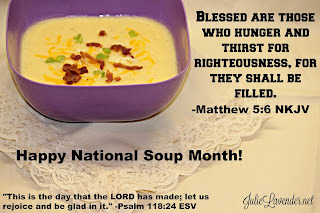 To serve, spoon the soup into bowls and top with small amounts of each: cheddar cheese, white cheddar cheese, bacon pieces, and green onion pieces.